Introduction : we have learnt how numbers can be represented on a number line ( it is denoted by a point which is no dimension).Line had one dimension. Can we locate our house as a point on a line? Don’t we need to have longitude and latitude to locate a city on a world map? Similarly, we need to provide the row and column position (Main and cross) to locate a house in a street? This representation can be called as two dimensional representations. This branch of mathematics is called co-ordinate geometry. The word graph means ‘to paint or ‘to draw’. 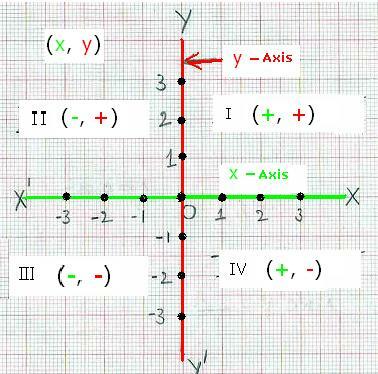 In the graph sheet, the horizontal line is conventionally called ‘x axis’. 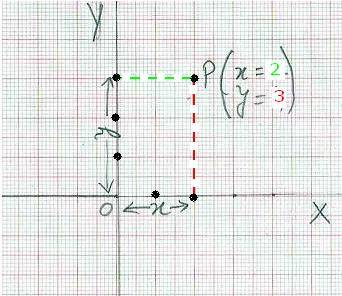 Let us draw a perpendicular line at O to x axis and extend this line both above and below the x axis. Again, by convention we call this vertical line as ‘y axis’. and below O on y axis at equal distances with same unit of measurement (say 1cm). 1. On OX it will be to the right of O at 1cm, 2cm, 3cm .,. 2. On OX1 to the left of O at -1cm, -2cm, -3cm …..
3. On OY above O at 1cm, 2cm, 3cm, …. axis some where forming a rectangle. 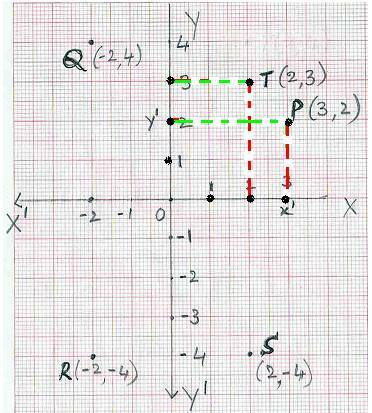 is called ‘x- coordinate’ or ‘abscissa’ of point P.
7.1 Problem 1: Plot the point P(3, 2) on the plane. Step 3: Construct a rectangle with sides Ox1 and Oy1 in Quadrant I. Exercise: Plot the point T(2, 3) on the plane. Do you notice that points P (3, 2), T (2, 3) are not one and the same? Exercise: Mark points Q(-2, 4), R(-2, -4), S(2, -4) on the plane. 1. The coordinates of the origin O is (0, 0). 2. 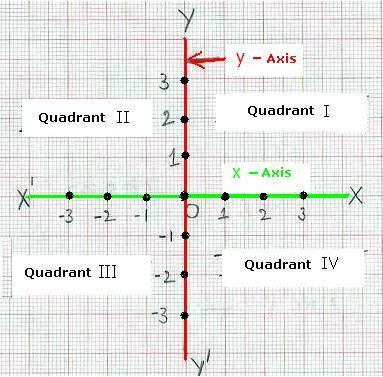 The coordinates of any point on x axis is ( x, 0). 3. The coordinates of any point on y axis is (0, y). We know that linear equation is an equation involving only linear polynomial or variable in first degree. All the above equations are of first degree and are of general form y = mx + c where c is a constant. Even if the given equation is of the form ax+by+c = 0 it can always be converted to the form y =mx+c. How ? Step 1 : Convert the given equation to the form of y = (i.e. LHS will have only y). So we have y = 3-x(transposition). 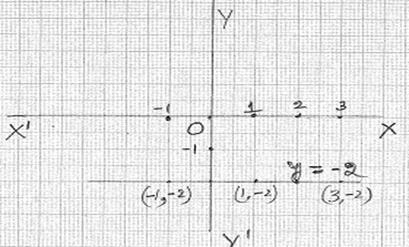 Verification: How are we sure that this line represents the equation x+y=3? Substituting this value in the given equation we notice that x+y =0.5+2.5 = 3. So any point on the straight line we have just drawn, satisfies the given linear equation. Similarly we find that point (3,0) is a point on the drawn straight line and satisfies the given equation. This proves that the graph represents the given equation. Since y= mx+c is a first degree equation and its graph represents a straight line, we call first degree equations as linear equations. We know that to draw a straight line we need only 2 points. Hence why is it necessary to have tables of (x, y) for various values of x and y? Why not have just 2 points with one point on x axis and another point on y axis, so that by joining these two points we can draw a straight line? 1. ‘x- intercept’ of a linear equation is the x-coordinate of the point where graph crosses the x –axis( It is the distance of point from O on x-axis). It’s coordinate has to be (x,0). To get this value of x, substitute y=0 in the given equation. 2. ‘y- intercept’ of a linear equation is the y-coordinate of the point where graph crosses the y –axis( It is the distance of point from O on y-axis). 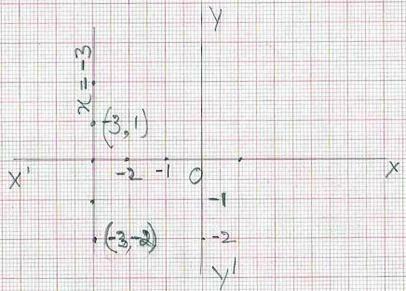 It’s coordinate has to be (0, y).To get this value of y, substitute x=0 in the given equation. Note that intercept means cut and hence x intercept means point of cutting of x axis and y intercept means point of cutting of y axis. Step 3 : Plot the points represented by (x, y) coordinates on a graph sheet and join them to get a straight line. This line represents the equation y=-2. 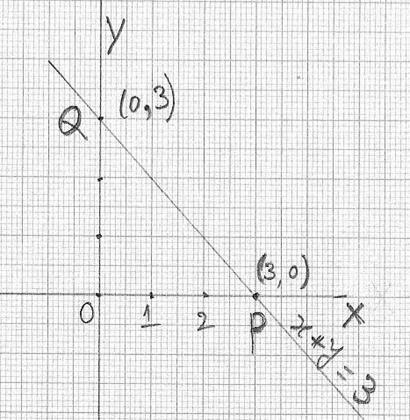 You can verify that the point (2,-2) is on this drawn line also satisfies the equation y = -2. 7.1.1 Problem 3: Draw a graph for 2y = -x. 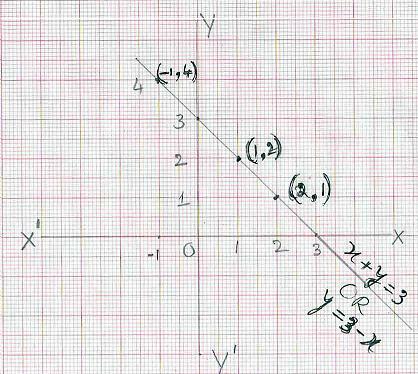 You can verify that the point (1,-1/2) is on this drawn line and also satisfies the equation y = -2. Note this drawn line passes through origin (0, 0). Thus if y=mx, then the line passes through origin. Note that this drawn line is parallel to y axis.